AutoMate 8 is the Leading Software for Automation of front and back-office business processes. AutoMate 8 provides all the tools necessary to completely automate business processes, regardless of their complexity. 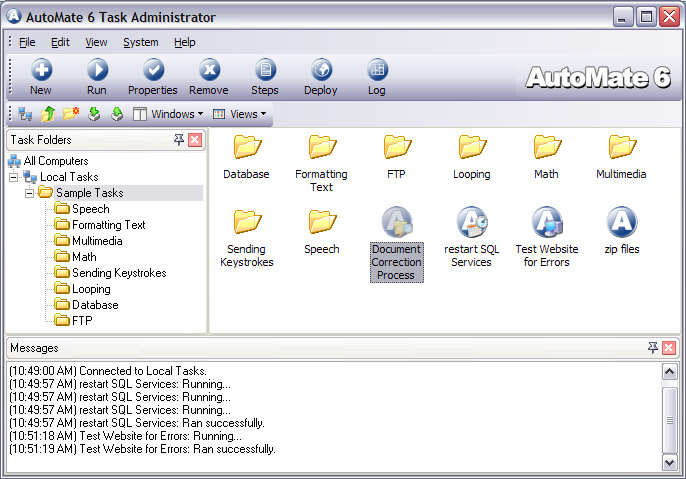 Tasks are developed via drag-and-drop without writing code. Simply drag together each action object in the sequence it should be executed. Active Directory actions - Integrate Human Resource and Employee Attendance applications with Active Directory, the most commonly used Windows-based IT system for managing the accounts, rights, and privileges of your organizations users. Secure SMTP and Exchange Email support - Updated email actions enable you to automate notification processes, report distribution, and much more using the latest security protocols and advanced Microsoft Exchange features. Exchange Object Manipulation Support - Automate common Microsoft Exchange tasks with Exchange Object Manipulation actions. Integrate Exchange seamlessly with Active Directory to make complex IT tasks manageable. XML actions - A robust palette of tools for extracting from and writing to XML documents, a key component of advanced technologies such as web services. Is an automated "Run As" function of Windows. Qweas is providing links to AutoMate 8.0.1 as a courtesy, and makes no representations regarding AutoMate or any other applications or any information related thereto. Any questions, complaints or claims regarding this application AutoMate 8.0.1 must be directed to the appropriate software vendor. You may click the publisher link of AutoMate on the top of this page to get more details about the vendor.